"There are many benefits to a rent to own agreement when it's done with a reputable company like BIG Real Estate Solutions of Greater Springfield, MO. We're with you all along the way during the process. Read below to see how the process works!" 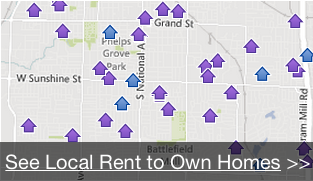 We’ll send you local Springfield rent to own / lease option homes that fit your criteria. After you’re approved to rent the property, pay a lease option fee (usually 5 to 10% of purchase price) which applies to purchase price of home, we’ll agree on a monthly rent amount and the future purchase terms. Then just sign the documents and move on in! Move in and pay your rent payments on-time… then at the end get a conventional loan. First step – sign up to find great properties around Springfield just by filling out the form on the upper right of this page.